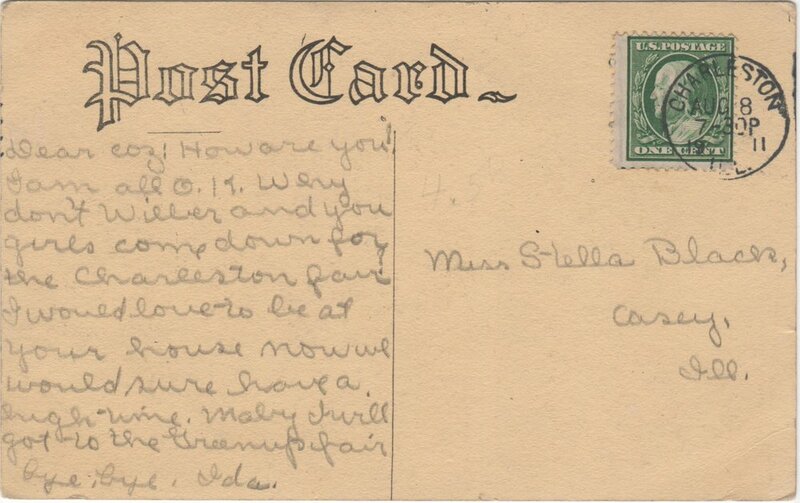 This 1911 postcard is delightful for two reasons: the beautiful pastel drawing and the extremely legible handwriting. How are you! I am all O.K. Why don’t Wilber and you girls come down for the Charleston fair. I would love to be at your house now we would sure have a high time. Maby I will go to the Greenup fair. A cast of characters is emerges: Ida, Stella, Wilber, and “you girls”. Ida and Stella appear to be cousins. Perhaps they all are? A round trip to Charleston from Greenup, via Casey is about 33 miles by present day roadways. All of these cities are generally situated in central Illinois, about equidistant between St. Louis, MO to the West and Indianapolis, IN to the East. What are the stories of Ida, Wilber, Stella, and “you girls”? What were the fairs like in 1911 Charleston and Greenup, IL (hint: try checking sites like newspapers.com for advertisements)? What do you think, feel, and wonder about when you look at the postcard and read the inscription? Is anyone special depicted on the front?